Shirts With Random Triangles: It's Western Michigan vs. Wisconsin in 2017 Cotton Bowl. 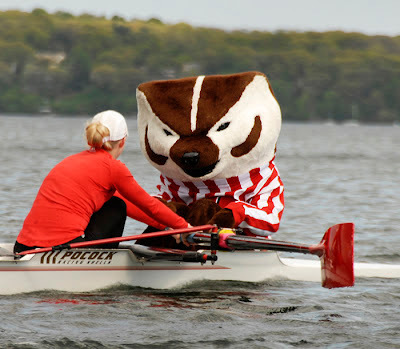 Here's Bucky Badger rowing a boat. Over-exuberant and possibly insane Western Michigan head coach P.J. Fleck has taken his "Row the Boat" mantra and led the Broncos to an 13-0 record in 2016. Wisconsin may not be the Broncos' toughest challenge coming up. It's biggest challenge is going to be trying to keep Fleck from being poached by a bigger school with a head coaching vacancy.